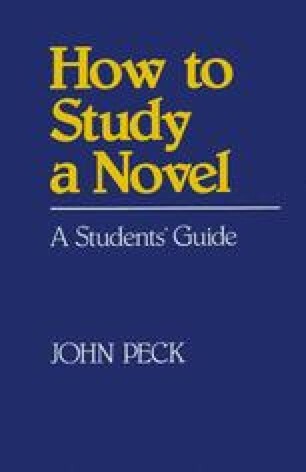 Whenever you write an essay about a novel, or any literary text, one of the most important things you are trying to do is to convey a vivid impression of what the book is like. That may seem such an obvious point that it hardly needs to be made, but it is not really so obvious, and certainly not so easy. For example, Dickens and Eliot are very different novelists, writing in very different ways, and an essay about either of them would only be successful if it managed to convey some clear sense of the ways in which they are distinctive. To reduce things to the simplest terms, with Dickens that might mean showing how he depends upon caricatures rather than characters, whereas with George Eliot you would probably want to show how credible and substantial her characters are. Such essays, as you can see, would be setting themselves fairly simple goals, attempting to provide clear illustrations of relatively straightforward points. But, although the targets are simple, it takes a long time, and a great deal of practice, to see clearly what you are aiming for in any particular essay, and to reach the point where you can provide a vivid demonstration of the case you want to make.